Don’t let their elaborately costumed concrete geese fool you: The South Side Irish of Chicago are practical people. They can stretch a dollar for miles when they must, a skill honed by raising big families with bigger appetites. My family’s Thanksgiving dinner each year bears the marks of this culinary arithmetic, which is why I’ve become intimately familiar with a side dish called Green Stuff. I’ve never tried Pink Stuff, and I never will. Unless readers of The Takeout demand it as content. We can forgive Ms. Doman her lack of titular flair, because this is as South Side as an entry can get. It reads like she dictated it to a friend who took her first delighted bite at a cookout and demanded the recipe right on the spot: “Just dump all four ingredients in a good-sized bowl,” Joan appears to dictate (as Margie O’Halloran scribbles it all down on the back of some receipt paper from her handbag), “Mix ’em together, and store it in the fridge.” How long does it keep? Oh, just until whenever it starts getting runny. As you can see from this photo evidence circa 2009, my mom always has the forethought to subtly shift the half-empty bowl over to the dessert table after dinner. Lack of standardization is both the charm and the curse of church cookbooks. How do I know what Ms. Doman would consider a “large” can of crushed pineapple? I don’t, but it doesn’t matter, because my mom’s always been the one to take the reins here. Green Stuff has been in heavy Thanksgiving rotation at our dinner since the early ’90s at least, bafflingly present at the main meal rather than dessert. 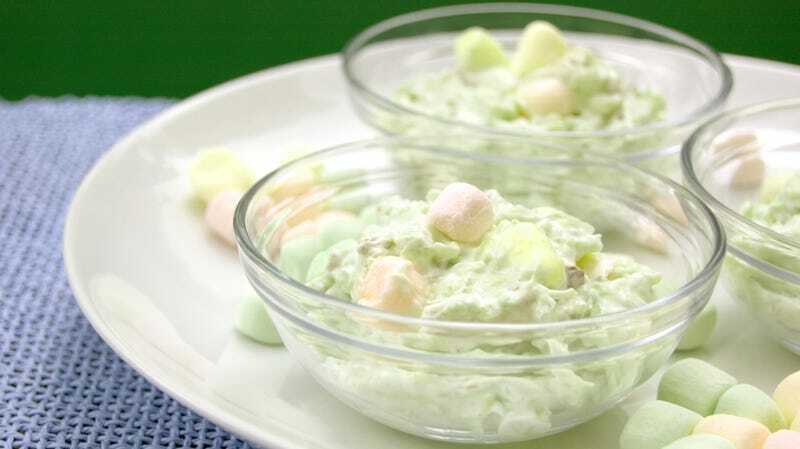 Though there were times when it got rotated out in favor of other sweet side dishes—taffy apple salad, strawberry pretzel jello, cranberry casserole—the years without Green Stuff stick out like missing teeth. Its color and consistency are as artificial as our enthusiasm is genuine. Our tasty little holiday Frankenstein. The Shure crowd population each year ranges from about 25 to 40, and because many guests take only as much Green Stuff as can fit between the cheesy potato casserole and broccoli cheese casserole, there’s always plenty to go around for the diehards. If any of you are looking for a side dish to contribute to your own family’s Thanksgiving spread, take a leaf out of the Brother Rice cookbook. Why trouble yourself with more than four ingredients when this quartet can make an impression that last a lifetime? Mix, refrigerate, serve, got it? Are you brave enough to make Vincent Price’s Steak Diane?